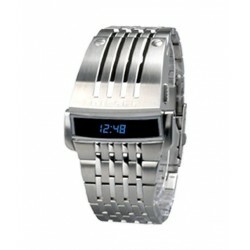 Product Specification Brand NIxon Display Digi.. Description Product Name: Diesel LED Watch DZ7080 LED Light: Cyan ​Bracelet : Stainl..
Short Description: Iron samurai Japanese inspired faceless Red LED wrist watch Looks like a .. Description: Dot matrix meter with black genuine leather belt. Square dial. Cool and Styli..